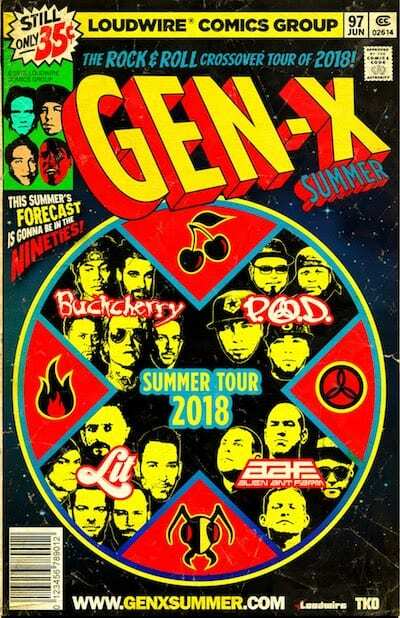 Loudwire is presenting the wildest rock show of the summer, featuring Buckcherry, P.O.D., Lit, and Alien Ant Farm for the Gen-X Tour. The tour is set to kick-off on June 28 at Milwaukee, Wisconsin’s Summerfest, and run across the country through early September. The trek will hit cities like Savannah, Baltimore, Trenton, and St. Louis, ending in Scottsdale, Arizona on September 7. A few of the performances are free-entry, including Michigan’s Stars and Stripes Festival, the August 6 show in South Dakota at Iron Horse Saloon, Oklahoma’s Choctaw Casino & Resort show on August 9, and the August 25 show in El Paso, Texas at Speaking Rock Entertainment. Generation X Tour tickets are on sale now. Check out the full list of tour dates below.